The main screen has pictures at the bottom of the page. The bag at left is the inventory link. The journal shows Nancy's notes about the present case. The checklist shows what needs to be done or was done in the case to progress in the game. The gear icon shows the options. Here the voice, effects and music volume can be adjusted. Also, the bottom background can be changed. Closed captioning and screen size selection are also in this page. The Load folder has the list of the saved games that can be replayed. The diskette is used to save the game. The rightmost icon closes the game. Open the case file and learn about the present mystery to solve. Ned asked Nancy to check up on Henry Bolet, a college friend while Bess and Nancy take a long weekend in New Orleans. Henry's great uncle Bruno just died. Click on the airplane ticket and to New Orleans you go. This walkthrough is only one sequence of gameplay. Nancy finds the door to the Bolet's house open. See footprints on the floor. In the great room, Nancy sees a costumed skeleton man. The lights go out and powder is thrown at Nancy. Nancy wakes up and is given a concoction by Renée Amande, the former housekeeper of Bruno Bolet. Stand up and talk to Henry Bolet at right corner of room. Henry is the executor of Bruno's estate. The place has exotic pets that have run of the place. Look around this room and see a card catalogue of books in the middle shelf left of Henry. Check the Miniature Modelers trophy left of that book case. Open the 1991 silver trophy at lower shelf to get eyeball 1 (cabinet slot 11). Pan left and check the books at corner left of fireplace. They can be moved and have tooth depicted on the bindings. To the left is another bookcase with an iguana on top of some books. Pan around and exit through the double doors to the hallway. Go forward and enter the great room. Great room: Let's see what that skeleton man is looking for here. Miniature cemetery: Go forward to the table. Look close at the miniature cemetery. Click-hold-pull the screen to see the different areas of the cemetery. Check the fountain close to the entrance. Go up and see the writhing tree. Look left at the crypt at the corner of the walled area SW of the tree. Check the big mausoleum left of the writhing tree. Look close at the roof. There are 4 framed etchings on the roof. The etchings can be changed inside the frames. Go to right side corner at Forty Winks Mausoleum and see-pick up the Mausoleum. 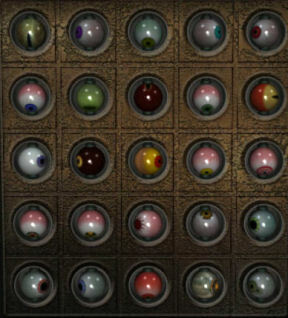 Open the door and take eyeball 2 (cabinet slot 12). Go to the area above here and see an alligator by the swamp-river. Click on the alligator. Check the arch left of the alligator. Denizens of the cemetery: Pull back and look at the book at right of the cemetery. See a list of the occupants of the cemetery and the areas where they were buried. Portraits: Go to the left corner of this wall and see family portraits. The one at the corner is missing. Each of these portraits is carrying something ah... unique. Pick up the paper from the floor in front of the portraits. It is tracing of a framed crow. Fireplace: Pan left and look close inside the fireplace. Take a burnt receipt from Zeke's. Take a coal. Marble puzzle: The aim of the puzzle is to get the pusher to the eye at bottom right corner of the box. The marbles and square can be moved to block the laser beam at center of the box. 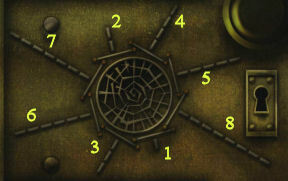 Use the keyboard arrows or the arrows in the screen to move the metal pusher around the puzzle. The reset is the square with the star at middle bottom of puzzle. Square (S1): Move square up 4 times and then right twice to be in same column as marble. Marble (M1): Move the marble up to hit square. Square (S2): Move square right, right, down, right and right. The square now blocks the second laser. 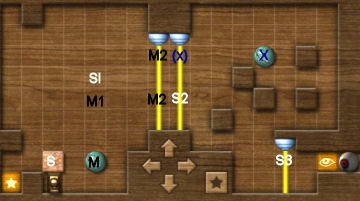 Marble (M2): Move the marble to right and then up to block first laser. Marble at right area (X): Move marble at right area to go left and then up to block second laser. Square (S3): Move the square right, up, right, up and right to the brown block. Move the square down to the bottom. Move the square left to the left brown block; then down, right, down and right blocking the last laser at bottom. Move the pusher to the eye. Pick up eyeball 3. Square: Move the square to 4th square down of first laser. Left laser is blocked. First marble (M1): Work on the right bottom marble. Move it to go left, then up and then right. Left laser is blocked. Square: Move the square to the right to block the third laser. Second marble (M2): Work on the lowest marble. Move it up to hit the other marble, right to hit square and then up. Second laser is blocked. Square: Move the square one up and right to block the fourth laser and even with the last marble. 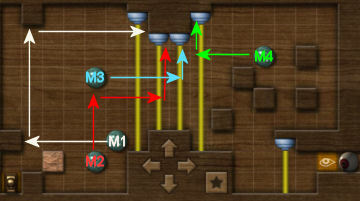 Third marble (M3): Move the third marble to right and up to block third laser. Marble at right area (M4): Move the fourth marble left to hit the third marble. Move the square to the right; then move the marble up to block fourth laser. Square: Move up and right to the right brown block. Move square down to the bottom Move the square left to the left brown block, down once, right once, down once and right blocking the last laser at bottom. Move the pusher to the eye. Pick up eyeball 3 (cabinet slot 5). Library: Talk to Henry completely. The empty frame had the portraits of Henry's parents. Learn about the miniature cemetery in the Great Room and the one Bruno oversaw next door. Potting area: Exit the door to be outside. Go left and talk to Renée potting some plants. Learn the partition of Bruno's will. She also saw the skeleton man. Look at a shovel with skeleton arm hanging on right wall; right of the first lantern. Garden: Look around the garden. They will be important later. There's a path to the right that goes to a loquat tree with a wasp nest. The fountain at the center doesn't have water. There's a drain. Inside the drain are a key and a spider that bites! The path to the right of the fountain goes to Bruno's crypt. It has buzzards guarding the pathway and a master of buzzard on the roof of the mausoleum. The path left of the fountain is the wall, a mushroom and some herbs on the fountain side. There are fireflies there too. The path ahead goes out to the cemetery that Bruno oversees. Let's check that out. Cemetery: Go through the gate. Go forward to the other side of the fountain. Go forward to the other side of the writhing tree. Bolet Mausoleum: See the lit Bolet Mausoleum. Look at the framed etching at the base of the wall and columns: 2 on this side and 2 on the left side. These are similar to the one seen in the roof of the miniature. We need to copy that. Go back to Renée and talk to her. After asking Renée for paper, she gives her room key. Enter the house and then to the hallway. Climb the stairs. Empty room: Enter the room at the landing. It's an empty sad room. Open the drawer and take eyeball 4 (cabinet slot 19). Exit the room. Renée's room: Climb the next flight of stairs. Use the key on the door. Open the top drawer left of the bed. Take papers. Open the bottom cabinet. Wow! She's a chocoholic! Take a Koko Kringle for you and one for her. You can eat as much as you want and not gain any weight. Try it and later, Nancy will get sick from too much chocolate. Look around the room. See a work table with hiccup powder on the left. Hic... hic... hic... Look close at the glyphs on the wall. Check the chest with a blue circle and symbols on the cover at other side of the room. We'll do this later. Go down and give Renée the chocolate. Talk to her completely and learn that wall writings are Hoodoo writings done by her. There is a spirit on the wall that made strange syllables. Bolet Mausoleum: Go back to the Bolet Mausoleum. Be sure that you already picked up a coal from the fireplace. Go through the gate and forward until the mausoleum. Exit the room and go down to the garden. Tracings: Use a paper on each of the 4 frames etched on the walls and columns. Automatically, use the coal to get 4 tracings. Go back to the great room of the house. Great room: Go to the miniature cemetery. Move the screen to the top left. Look close at the roof of the mausoleum. Frame puzzle on mausoleum: The object of the puzzle is to enter the correct picture in each frame. There are arrows on the side of the frame to cycle the picture. Use the tracing from the Bolet Mausoleum as the clue. Take note that each frame is different from the others. Solution: Top left - crow, top right - crossed bones, bottom left - worm and bottom right - coffin. Mausoleum: Go back to the Bolet Mausoleum. See Henry crying in front of the mausoleum. How sad. Use the gold key on the door. Enter and look at the headstone of Henry's parents at left: Marianne and Claude. Pick up the rolled paper- portrait of Henry's parents at top of the steps at bottom right. Great Room: Go back to the house and the great room. Portraits: Place the portrait of Henry's parent on the empty frame. Phone calls: Let's do some phone calls. Call the Cab Company and then Ned. Call Bess at the hotel. Play as Bess: See a Gumbo mobile shop, a man across the street and Zeke's across the hotel balcony. Zeke's: Go across and enter Zeke's. Look around at the Curio shop. Go forward and right to Lamont, the owner of the place. Talk to Lamont completely. Learn that the receipt is for a large box of assorted items bought from Henry Bolet. The box is in the back room. Look around. Go to the cabinet right of the door. Check the 5 bottles: crying powder, giggling powder, itching powder, stinking powder and sneezing powder. Bess automatically takes the sneezing powder after talking to Lamont. Rube Goldberg contraption puzzle: Turn left and face the wall with old piano. Stand on the scale and get an idea. The aim of the puzzle is to create a situation where whomever stands on the scale gets a dose of sneezing powder. Move the items on the shelf and piano to create this situation. Test the process by standing on the scale. Take an item and click it over another item to place it in that position. Top shelf (left to right): Bowling ball on top of stand, accordion and sneezing powder. Chattering teeth on top shelf over the balloon. Left pan under Zeke's sign: Shrunken head. Top of piano (left to right): Large book, several books, hula dancer and phonograph. Test the set up by standing on the scale. Bess should say - 'that will do it'. Box: Go to the back room while Lamont is sneezing like crazy. Click on the box. See a picture of a young boy and dog. There a label of Bruno and... There's another picture of an iguana wearing a pirate costume complete with a hat. There is a skeleton costume with hat. Open the box: Look at the letters on top of the wood box. Read the French vacation letter and the note with Hamlet and numbers. Check Bess' observations in the journal. Using the Hamlet clue numbers as guide, count off the number of alphabets in the French vacation letter and write down the letter it stops on. Hamlet: 1 - L, 3 - E, 32 - B. Hamlet: 8 - E, 3 - N, 6 - U. Hamlet: 8 - N, 14 - D, 4 - T. Hamlet: 1 - O, 12 - D, X. Enter on the code lock: LEBENUNDTOD. Inside the box, read the letter about the Whisperer. Bess automatically calls Nancy and gives her findings. Play as Nancy: Where did we see an iguana? Go to the library, go forward and look close at the book case with the iguana. Iggy: Look close at the iguana. Click on the book in the box and see that the iguana is alive. Henry says that Iggy likes to steal papers. Books - Arrange the books that Iggy dropped. Look close and arrange all the books to fill inside the box. Click-hold-drop the books in position. Be sure that the books are set close to the edges. Check for spaces between books. The Crystal Skulls: Fact or Fable: Read the blue book at right by Beatrice Hotchkiss. See her phone number on the title page. Take the paper with letters and dots inside the book. Learn about the history of the Whisperer. Henry: Talk to Henry. Learn that Bruno died of myocardial infarction. He shows the death certificate. The signing physician was Bruno's best friend - Gilbert Buford. Note the eyeball key chain. It was Bruno's. Renée: Go outside and talk to Renée. She doesn't know about the crystal skull. Learn how Bruno died. Dr. Gilbert Buford - Call Dr. Buford. The answering service answers. Learn that Dr. Buford is at his favorite gumbo stand at corner of Rampart and Dumaine. Play as Bess: See Dr. Buford sitting across the road. Go down and talk to Dr. Buford. Learn about the situation he found Bruno and the letter that Bruno must have been reading and holding. Iggy must have taken it. Bruno trained Iggy to retrieve things it has stolen. Gilbert also mentions what he thinks about hoodoo. Call Nancy. Play as Nancy: Let's check on clues we found already. Portraits: Go to the Great room and to the portraits. Study the portraits. 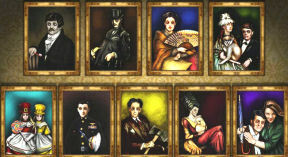 Note that all the portraits carry a unique item and note that the arrangement of the frames is similar to the piece of paper found in Hotchkiss' book. Top row (left to right): T(oothpaste), B(anana), F(an), M(onkey). Bottom row (left to right): L(ollipop), H(at), A(xe), P(oodle), U(mbrella). Secret passage: Enter and hear Henry talk to his girlfriend Summer. Look through the peephole looking in the library. The peephole is pointed at the bookcase at corner of the library. Use the switch at right to zoom in. It's a book titled 'The Eye of the Beholder'. Pull back and turn right. Go up the stairs and see a spider web lock. That really looks familiar. Spider web lock - Note that each line surrounding the spider web has broken lines. Take note of the number of lines. Dry fountain in the garden - Go to the garden and look at the drain hole. 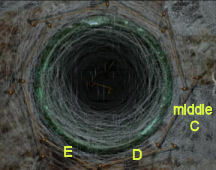 Click on each line in the order shown by the clue on the secret passage's door lock. See a small platform rise up. Take the key. Go back to the secret passage left of the fireplace at the great room. Use the key on the door lock at top of the stairs. Secret Room: See that this is Bruno's secret room. Look around. The Eyeballs cabinet: Turn left and open the cabinet with ship and octopus door. It's where the eyeballs are kept. There are 25 slots. Take the eyeball 5 (cabinet slot 17) already there. So, we need to collect 25 eyeballs. Bowling lane: Look at the bowling lane machine. The object of the puzzle is to get the balls to turn all the pictures into eyes. Take a ball and place it on the circle on the lane at right. Click-hold and move the cursor. See a red arrow that shows the trajectory of the ball. Using the length and direction of the red arrow, the ball can aimed to the picture you want to change. From looney4labs: To get the ball to the very back row, I needed to have the ball bounce off the sides several times. Use the steepest angle to do this. To get it to the middle row, use a much shallower angle, and of course, for the first row, just aim it. Thanks, L4L. Practice and see the distance to get to the different rows and where the arrow should point at. Good luck. When all the pictures are eyes, take eyeball 6 (cabinet slot 14). Easter egg from HI forum - Change all the pictures to chickens and get an Easter egg. Then change all pictures to mouth and see what happens. Pirate dummy: Pan right and look close at the pirate dummy. Press a button and then press the talk button on the left side. Hear the dummy repeat that syllable. It has a nice blue eye. Iggy: Look above the dummy and see an open vent. This must be where Iggy hides his stash. Look and open the small cabinet right of the dummy. See small costumes. This must be Iggy's wardrobe. Dental chart: Look above the desk and see the chart that identifies the baby teeth and adult teeth. Take note of the location of the teeth. Bruno's desk: Pan right and look at the items on Bruno's desk. Calendar book - Open the book on the left. See that once a month a day is marked with skull and crossbones. The notes have a word and a location. May 31st, that's today. Scuttled Bones and Rampart and Dumaine are written on the right page. Aha! Short Stories for Tired Eyes - It is a book written by Bruno Bolet. It is dedicated to those who hear the whisper. This book has tons of clues. Invitation - In 1952, Bruno was invited to join the Jolly Roger krewe. Picture - See a picture of the Jolly Roger krewe. They are wearing skeleton costumes. Read the inscription on the frame. Pendulum - Check the pendulum on the top shelf. The right one is an eye. Press the lever and immediately try to grab the eye when it goes out of the glass cover. There are only 2 chances to grab the eyeball. Press the button to stop the swing. Take eyeball 7 (cabinet slot 15). Yellow Spider in the Box: Turn to the other side of the room. Turn the handle of the yellow Spider in the Box left of the door until the spider pops out. Write down the notes that it plays whenever the handle is turned. Gumball machine: There's a gumball machine on the left. Press the button and chew a gumball. Lamp: Look close and click on the lamp holder under the picture. It opens a door to the sad room - Bruno's bedroom. Bruno's bedroom: If you have not taken the eyeball from the drawer by the bed, do so now. Exit the room. Enter and look at the chest at the corner. Chest puzzle: There are 18 buttons around a blue circle. There are glyphs on the side. When a button is pressed, a pattern is seen on the central circle. To open the chest, reproduce each of the 4 side glyphs at the circular glass at the center of the chest. Top left glyph: Press buttons 1, 4, 7 and 15. See the glyph turn. Top right glyph: Press buttons 5, 8, 10 and 12. See the glyph turn. Bottom left glyph: Press button 2, 9, 16 and 17. See the glyph turn. Bottom right glyph: Press buttons 11, 13, 14 and 18. See the glyph turn. The chest opens. Read the hoodoo book. 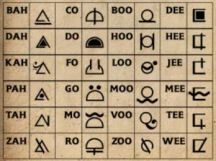 Using the hoodoo book, find the syllable that corresponds to each glyph on the wall. From left to right: Bah, zah, loo, pah, dee, moo, kah. Secret room: Go down the stairs and enter through the secret hallway left of the fireplace in the great room. Enter using the key to Bruno's secret room. Pirate dummy: Look close at the dummy. Press the buttons: Bah, zah, loo, pah, dee, moo, kah. Press the talk button. His eyeball popped out. Take eyeball (cabinet slot 6). Look inside the eye socket and take the eye token and the note about the 'last denizen buried on my guard' clue. We will follow on this later. Gumball machine: Insert the eye token in the gumball machine. Take eyeball 9 (cabinet slot 13). Pull the lamp holder on the wall. Exit and then go down. Grandfather clock: Go to the grandfather clock at end of the hallway. Read the 'Time Will Tell' story in the 'Short Stories for Tired Eyes' book in inventory. Write down the numbers-time of day found in the story. Then enter that time of the day on the clock in the correct order as read from the book. Midday (12), three hours have past (3), move ahead two hours more (5) and nine hours before (8). Six hours before (2) and moved ahead nine (11). Enter 12, 3, 5, 8, 2, 11 on the clock. Press the eye button on top of the clock after each number. This enters that number. Take eyeball 10. High noon (12), Five hours ago (7), gone in three (10). Would be 5 hours (3), two hours from now, (2), an hour later (1). Enter 12, 7, 10, 3, 2, 1. Press the eye button on top of the clock after each number. This enters that number. Take eyeball 11. Midnight (12), fours hours before (8), mere two hours (10), six hours after (4), usual five hours (9), two hours later (11). Enter 12, 8, 10, 4, 9, 11. Press the eye button on top of the clock after each number. This enters that number. Take eyeball 12. Clock eyeballs are in cabinet slots 1, 2 and 3. Eye of the Beholder: Go to the library. Go to the corner bookcase by the window that was seen in the close of the secret passages' peephole. Take the book 'Eye of the Beholder'. Open the book and take eyeball 13 (cabinet slot 10). Read the 'A Librarian's Tale' story in the 'Short Stories for Tired Eyes' book in inventory. The clue states 'at the cards that keep track of every book'. Go to the bookcase left of Henry. Open the library card catalogue. The next clue states: '...get such an eye'. Another clue states: 'the title's the thing, addition's the hook'. Go through the different book title in the card catalogue. Note any title that has an eye on it and write down the number associated with it. Then add the numbers. My Eye and Other Tall Tales (401), The Camel in the Needle's Eye (608), Cat's Eye (010), Eye Candy (004), Grinding Fake Eyes (511), Turn a Blind Eye (006). The total is 1540. Look up and take the book at right on the top shelf - A Librarian's Tale. It has lock on the cover. Enter 1540 on the lock. Take eyeball 14 (cabinet slot 8). Bruno's Key chain: Talk to Henry and ask for Bruno's eyeball keychain. Nancy ends up mentioning Zeke's box and Summer. Take eyeball 15 (cabinet slot 7). Talk to Henry again. Read the 'The History of Quincy T. Booker's Teeth' story in the 'Short Stories for Tired Eyes' book in inventory. Go to the bookcase at the corner left of the fireplace. See the books that have tooth on the binding. The bottom books are 5 each side. The top books are 8 books on each side. The bottom books represent baby teeth while the top books represent the adult teeth. 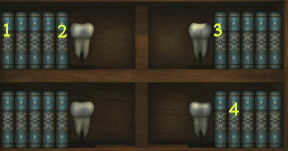 The object of the puzzle is to click on the books in the order based on Booker's Teeth history. Use the dental chart in the secret room as reference. Baby teeth (from center to the back) - central incisor, lateral incisor, canine, first molar and second molar. Adult teeth (from center to the back) - central incisor, lateral incisor, canine, first bicuspid, second bicuspid, first molar, second molar and third molar. The baby teeth mentioned in the history: upper right second molar, upper right central incisor, lower left lateral incisor and lower right canine. The adult permanent teeth mentioned in the history: lower right canine, upper left first bicuspid, lower left canine and lower left 3rd molar. When looking for the book based on the chart and history, remember that you are looking at the mouth. So, the left side of the bookcase is the patient's right side and the right side of the bookcase is the patient's left side. Baby teeth: Look close at the lower bookcase with teeth bookends. Click on 5th from center on top left side, first book from center on top left side, first book from center top right side and second book from center on bottom right side. Automatically pull back. Adult teeth: Look close at the upper bookcase. 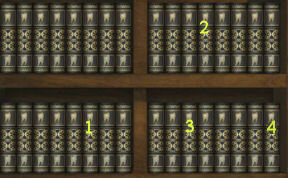 Click on third book from center at bottom left, 4th book from center at top right side, third book from center at bottom right and 8th book from center at bottom right side. Take eyeball 16 (cabinet slot 9) when the panel opens. Go outside and talk to Renée. Borrow her shovel. She needs 5 painted conks. Take the bag from the table. Take the path left of the fountain. Pick mushroom 1 from the lawn. Go towards the cemetery gate. At the gate turn around and pick mushroom 2 from the lawn at left. Go through the cemetery gate, take the right path from the fountain, go forward until the end and go through to the swamp at right. Take mushroom 3 at end of the log. Eeek! Meet Bernie the alligator. Go back to the cemetery and take bottom path pass the fountain until the end. Take mushroom 4 by the wall. Go back to the fountain. Go to top path pass the writhing tree and then left from the Bolet Mausoleum. Go through the archway. Take mushroom 5 from the overlook. Turn around, forward, right and forward back to the house. Give Renée the mushroom. Talk about Bernie and learn that it is trained to jump out to catch marshmallows when the log is touched. Take the shovel hanging on the wall at right. Fountain and spider web notes: Go to the fountain and look at the drain hole again. Remember the spider in the box in the secret room. It played a note whenever the handle is turned before the spider pops up. Pluck the strings of the spider web in the order the notes were played in the pop up box. Click on middle C, middle C, middle C, D, E, E, E, D, middle C, D, E and middle C.
Take eyeball 17 (cabinet slot 4). Cemetery denizen hunt: Go to the great room. Go to the book at the corner that has the list of people buried in the cemetery. The object of the puzzle is to identify the person in the seen clue; go to its headstone, read a new clue and look for the next headstone. The book has the first name, surname and the area in the cemetery they are buried in. Use the miniature cemetery to locate the area and then go to the cemetery next door. Read the clue in the paper taken from the pirate dummy's eye socket. The last denizen buried on my guard, will start you a-hunting through the graveyard, what's written on the headstone will lead you to another, And so on and so forth til tiny treasure you discover. Search the book for the last entry. Turn to page 91. See that it is Tammy Tassleman in Terra Siesta. Using your computer's keyboard, type in Tammy Tassleman in the skull paper in inventory. Press enter key. This will activate Terra Siesta. Find Terra Siesta at top right in the miniature cemetery. Go to Terra Siesta. Click and read the headstone. Couldn't sleep without a peep, so when she died we buried her deep. Go back to the book at the great room and search for a name that fits the clue. Turn to page 79 and see the name Constance Norring at Crowing Crypts. Type in Constance Norring in the skull paper in inventory. Press enter key. Find Crowing Crypts in the miniature cemetery. Go to Crowing Crypts and read the headstone. Turn to page 84 and see the name Justin Thyme at Sorrow Park. Type in Justin Thyme in the skull paper in inventory. Press enter key. Find Sorrow Park in the miniature cemetery. Go to Sorrow Park and read the headstone. Turn to page 85 and see the name Manny Kinn at Writhing Roots. Type in Manny Kinn in the skull paper in inventory. Press enter key. Find Writhing Roots in the miniature cemetery. Go to Writhing Roots and read the headstone. Turn to page 77 and see the name Owen Moore at Sorrow Park. Type in Owen Moore in the skull paper in inventory. Press enter key. Turn to page 84 and see the name Neil Down at Crowing Crypts. Type in Neil Down in the skull paper in inventory. Press enter key. All that's left of me are these old bones. Turn to page 86 and see the name Myra Maines at Terra Siesta. Type in Myra Maines in the skull paper in inventory. Press enter key. Find Terra Siesta in the miniature cemetery. Go to Terra Siesta and read the headstone. Bloomed too late, pruned too early. Turn to page 85 and see the name Rose Winterspring at Slumber Gardens. Type in Rose Winterspring in the skull paper in inventory. Press enter key. Find Slumber Gardens in the miniature cemetery. Go to Slumber Garden and read the headstone. She would have given you the shirt off her back. Turn to page 78 and see the name Polly Ester Givens at Forty Winks Mausoleum. Type in Polly Ester Givens in the skull paper in inventory. Press enter key. Find Forty Winks Mausoleum in the miniature cemetery. Go to Forty Winks Mausoleum and click on the etched Givens. Take the scroll. Same name as my dog at ten, Moved from his grave and buried again. Find the name of Bruno's dog: Call Bess and get her to look at the picture of Bruno in the box at Zeke's. As Bess, talk to Lamont. He will recommend the gumbo from the gumbo shop outside the store but 'watch the hot sauce'. It gives his stomach instant fits. Aha! Exit the store and go to the gumbo shop truck. Order a gumbo to go. Add hot sauce to the gumbo. Then cover the bowl and take the gumbo. You can try and order jambalaya and crawfish. That was yummy! Talk to Dr. Buford about everything. Go to Zeke's and give the gumbo to Lamont. Uh Oh! Go to the backroom and open the box. Click-hold-move the picture of the boy and dog and see that the name is Grant. 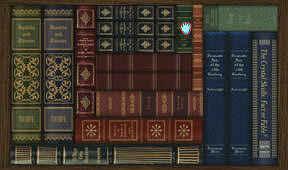 Play as Nancy: Go back to the book at the great room and search for a Grant. Turn to page 82 and see the name Derek Grant at Writhing Roots Mausoleum. Find Writhing Roots Mausoleum in the miniature cemetery. Go to Writhing Roots Mausoleum. Open the box at the bottom of the headstone. Take eyeball 18 (cabinet slot 24) and a little pirate hat. Talk to Henry about Bruno and the crypt. Charlie Wicker: Read the 'Steps in the Right Direction' story in the 'Short Stories for Tired Eyes' book in inventory. Go back to the book at the great room and search for a Charlie Wicker. Turn to page 82 and see the name Charlie Wicker at Sleeping Meadows. Find Sleeping Meadows in the miniature cemetery. Go to Sleeping Meadows. Look at the letters under Charlie Wicker's Name. Use blank paper to get a tracing of the directions. Enter at right to the forest. See an overhead view of the area. Using the directions on the tracing, click on the compass central button to move the spade. Once a direction is reached, count the fingers of the skeleton to know how many times to move to that direction. Just follow the first number that the skeleton hand show, it might be erroneous after that (tricksy!). W-4, N-2, E-1, S-3, W-2, N-2, W-3, S-3, E-1, N-2, E-1, N-3, E-4, S-5, W-2. Use the shovel on the ground. Use the shovel to open the canister. Take eyeball 19 (cabinet slot 25) and the shovel handle-skeleton arm. Buzzards at Bruno's crypt: Go to Bruno's crypt beside the garden fountain. Look down at the circle on the ground - the headstone. Look up and see the master of buzzards on the roof of the mausoleum. It has feathers on its head. Read the 'The Key to the Statues, the Statues are Key' story in the 'Short Stories for Tired Eyes' book in inventory. Take note of the drawing in the book of the master of buzzards. The arrangement of the feathers is seen. The object of the puzzle is to get the master buzzards feathers similar to that of the picture. Turn around and see 4 buzzards. Clicking on each one produces a change in the master buzzard's feathers. Check the changes made by the 4 buzzards to find out which ones to click to get the drawing. Go to the fountain to reset the puzzle. Click from left to right (1-4): 3 3 1 1 4 2 1 4 or 3 3 2 1 1 4. Take the feather key dropped by the master buzzard. Turn around and use the feather key on the feather lock at base of each gargoyle to get eyeballs 20-23 (cabinet slots 20 -23). Loquat tree and the wasps: Take the path at left before going to the back door of the house. Go forward and see a loquat tree and a bug sprayer. Take the bug sprayer and click on the tree. The object of the puzzle is to kill all the wasps and get a loquat. Kill the red wasps immediately. They sting and after a number of stings by the red wasps, game ends and second chance happens. Iggy the pirate: Go to the great room; enter the secret hallway and the secret room. Look at the air vent above the dummy where Iggy hides. Place the loquat on the vent. See Iggy stand beside his wardrobe. Open the wardrobe. Dress Iggy in a pirate costume: pirate hat on his head, white collar with parrot on his neck and sword belt on his waist. Pull back and Iggy retrieves a small chest. Read the plaque on top of the chest: The name that opens every Jolly Roger meeting opens me. Jolly Roger name: Go to the desk and look at the calendar on the left. Open through the pages and at May 31, if Nancy hasn't said it earlier, she says that it is today. The meeting is at Rampart and Dumaine and the password is Scuttle Bones. Call Bess to infiltrate the meeting. She has to wear a costume. So she has to enter Zeke's store and retrieve the skeleton costume. As Bess: Go to the alley right of the table. Turn left to Zeke's locked back door after the trash bin. Padlock: Look close at the lock of Zeke's door. See a number pad on the lock. The x key resets the puzzle. Use the compact in inventory to dust the key pads. See 5 numbers light up. Using the amount of powder on the keys, deduce the sequence of the 5 numbers. The more powder, the first in the sequence in will be. Press 2 8 9 0 5. Enter and open the box. Wear the skeleton costume. Exit through the emergency door. Jolly Rogers meeting: Turn left and go forward to the double metal doors. Knock on the door. Select Scuttled bones as password. Hear them say Jean Lafitte. Oops! That cell phone! Watch what happens to Bess. My! Bess becomes a lioness! Listen to Bess' report until the phone get disconnected by a loud thunder and lightning. Small chest: Take the small chest and enter Jean Lafitte on the padlock. Take eyeball 24 (cabinet slot 16). Get another loquat from the wasp infested loquat tree. Go back to the secret room. Use the loquat on the vent to call Iggy. Dress Iggy as an optometrist: Head lens, name tag on collar and ophthalmoscope on the waist. Pull back to get Iggy going. Take eyeball 25 (cabinet slot 18). Dress Iggy as a mailman: Hat, tie and bag. Pull back to get Iggy going. Take the letter. Read the letter that Bruno was holding when he had the heart attack. The crystal skull is a fake. Go to the eyeball cabinet with an octopus and ship depicted on the door. All 25 eyeballs are placed in the cabinet. Click to see that they can be moved up-down-right-left. Read the 'Plentiful Pirates and Nautical Nonsense' story in the 'Short Stories for Tired Eyes' book in inventory. Position the eyeballs by following the story and looking for words that forms a direction. The numbers at the bottom of the page shows how many directional words are in that page. For example: Page 1-5. Stealthily stalking them, famished and anxious, out hunting west waters, he was cantankerous. Out here were the sea-stricken pirates aplenty. A week's worth of looting left their Large stomachs empty. 1 - 5: south, west, south, east, left. 6 - 7: down, down. 8 - 12: up, down, east, east, left. 13 -16: east, down, down, down. 17 -20: down, left, north, west. 21 - 22: right, left. 23 - 25: down, right, left. Take the drawing and the jeweled eyeball. Talk to Renée about the letter. Authenticator: Use the cell phone away from Renée and call the authenticator. Learn the truth about the crystal skull. Go forward to the left side of the fountain. Go left to the fireflies. Move the ivies off the wall. Push the 2 stones to the back. Go through the cemetery gate. Turn around and go to the broken wall at right. Now that you protruded the stones, go up and take the lightning rod. Bruno Bolet's crypt: Go to the buzzard crypt. Check the drawing taken from the eyeball cabinet. Look down at the circle with Bruno's name. Place the lightning rod on the hole. Place the skeleton arm on top of the rod. Place the jeweled eyeball on the skeleton's hand. The circle on the floor lowers down to the crypt. See the Whisperer! Take the Whisperer. Watch as the lid starts to close. The villain arrives and will help Nancy up. Nancy tosses the crystal skull to the villain. The villain explains the reasoning for the nefarious acts done and leaves Nancy to her fate. Immediately turn around and click on the wall. Memory puzzle: This is a random puzzle. Click on duplicated pictures to turn them around. The flashes of lightning light up and darken the room. When all the pieces are done, the lift rises up. Go to the cemetery, turn right and forward to the river-swamp. Tip the log to get help from Bernie. Listen to Nancy's explanation of the case.